Lakhs of devotees landed in the twin pilgrim centres of Nashik and Trimbakeshwar on Saturday morning for the first 'Shahi Snan' (Royal Bath) of the Kumbh Mela. 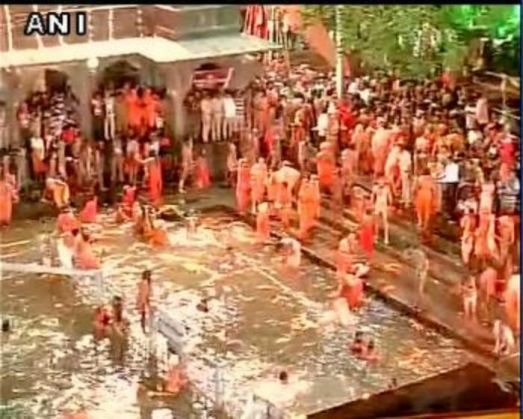 The authorities have made elaborate security arrangements as over a crore people are expected to assemble for the holy dip. Thousands of sadhus belonging to the Vaishnav and Shavia sects were the first to take the 'Shahi Snan' in Nashik. Nashik Kumbh Mela is celebrated when Jupiter and the sun falls on the zodiac sign, Leo. The Nashik Kumbh Mela is one of the most revered festivals of India and is organized at a big scale. According to mythology, it is believed that when the gods and demons were fighting over nectar, Lord Vishnu flew away with the pot of nectar and spilt drops of nectar at four different places -- Hardwar, Nashik, Ujjain and Prayag, where Hindus traditionally now celebrate Kumbh Melas. The celebration of Kumbh Mela depends on the position of Jupiter (Brhaspati) and the sun. When the Sun is in Aries (Mesh Rashi) and Jupiter in Aquarius, it is celebrated in Haridwar. When Jupiter is in Taurus (Vrishabha Rashi) and the Sun is in Capricorn (Makar Rashi), then kumbh is celebrated at Prayag. The Kumbh Mela is celebrated in Ujjain when Jupiter and the Sun are in Scorpio (Vrishchik Rashi). It is said that when the Jupiter and the sun falls on the zodiac sign, Leo; then Kumbh Mela is celebrated at Trimbakeshwar in Nashik.